By Stanley White: Former WBO cruiserweight champion Krzysztof Glowacki (29-1, 18 KOs) survived a 5th round knockdown to come back to defeat 31-year-old Ukrainian prospect Serhiy Radchenko (6-1, 1 KOs) in winning an 8 round unanimous decision on Saturday night at the Hala Nysa, ul. Sudecka 23 in Nysa, Poland. Radchenko knocked Glowacki down in round 5 with a left hand to the head. Radchenko knocked the 31-year-old southpaw Glowacki down moments before with a hard right hand that caused him to reach down and touch the canvas with his right glove to keep from falling, but for some reason the Polish referee Grzegorz Molenda chose not to call it a knockdown. It didn’t matter. Radcheneko unloaded with a big right hand to the head that put Glowacki down on the canvas. 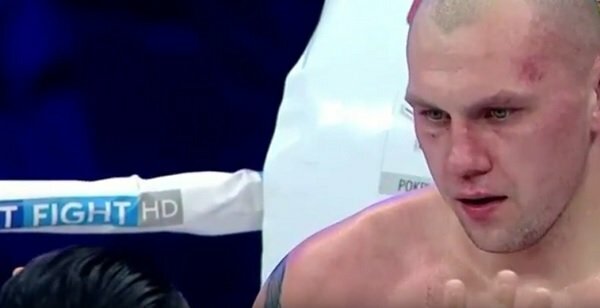 After the knockdown, Radchenko tried to finish Glowacki off, but he wasn’t able. A mistake Radchenko made was putting Glowacki in a headlock in the final moments of the round. The referee then told the two fighters to break. During the break, Radchenko nailed Glowacki with a right hand, which led to the referee giving him a warning and taking him to the far side of the ring. That ate up some valuable time that Radchenko could have used to try and finish off Glowacki. Glowacki looked very beatable in this fight. He looks like he’s aged since his loss to Oleksandr Usyk in 2016. He’s not the same fighter. Glowacki’s high point of his career was beating a faded Marco Huck by an 11th round knockout in August 2015. That was the best win of Glowacki’s career. The win for Glowacki was his third consecutive since his one-sided 12 round unanimous decision defeat at the hands of Oleksandr Usyk on September 17, 2016. Glowacki lost his WBO cruiserweight title to Usyk. Since that loss, Glowacki has beaten 3 lower level fighters in Hizni Altunkaya, Leonardo Damian Bruzzese and Radchenko. It’s unclear how much longer Glowacki is going to devote his time to fighting weaker opposition. Glowacki is going to be in a shock when he has to fight a good opponent after the WBC cruiserweight title is vacated after the World Boxing Super Series tournament (WBSS) ends. Usyk and Murat Gassiev, the 2 finalists in the WBSS tournament, have said they plan on moving up to the heavyweight division after the WBSS tourney ends. That means Glowacki will be battling for the vacant WBC cruiserweight title against Maxim Vlasov or Andrew Tabiti. Even if Glowacki gets lucky and is able to fight a flawed contender like Tabiti for the WBC belt, he’s probably not going to be able to hold onto the WBC title for long. Eventually, Glowacki would need to fight Vlasov or Mairis Briedis, and he probably won’t beat either of those fighters. Glowacki doesn’t look to have the talent to beat either of those fighters. Gassiev would likely destroy an easy to hit fighter like Glowacki. In other fights on last Saturday’s card, former cruiserweight champion Krzysztof Wlodarczyk (54-4-1, 38 KO) stopped journeyman Adam Gadajew (17-15, 8 KO) in the 2nd round. In Wlodarczyk’s previous fight, he was knocked out in the 3rd round by Murat Gassiev last October in the quarterfinals of the WBSS tournament.